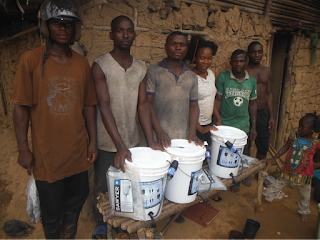 The second largest killer in Liberia is dirty water. In July, we finished distributing water filter systems in every village home of our county!!!! This month we installed the last nine water filter systems in our county. We also followed-up with 414 homes in twenty-four counties in which we previously distributed filters. We will soon start distributions in another county. Thousands of people are now drinking clean water because of our distribution. Every home visit by our filter teams also includes evangelism and discipleship. 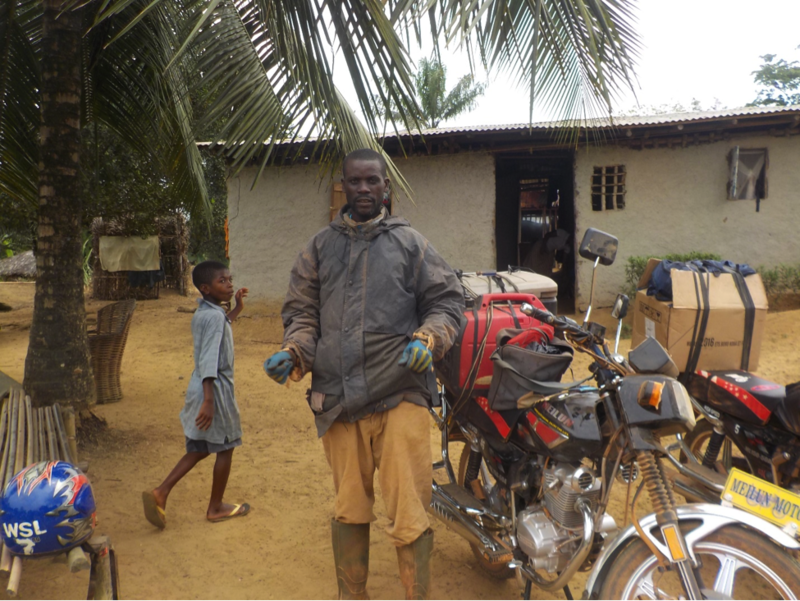 This is Samuel distributing water filter systems in a small remote village. Thanks to the Sawyer Corporation and The Last Well organization. Because of them, we receive these filter systems for free. Once again, we did twenty baptisms this month. 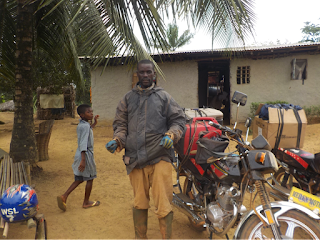 Our teams go to the villages on motorbikes. This month twenty-nine missions were sent to fifty-seven villages in five different counties. When we go to these villages, we do evangelism, discipleship, church planting, and pastoral training. A mission can be out for several days. Motorbikes are dangerous! We all have wreaked and bled. Many have had broken bones and one has died. The picture above is of Messiah. 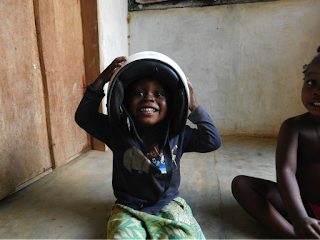 He wrecked while distributing water filters and his helmet split in two. 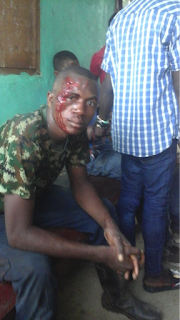 I was there while they were stitching his face and hand. He saluted and said such things will always happen. He stayed on our base while healing. A couple weeks later he came to me with a big smile stating that he could now put on a helmet and was ready to be sent out again as I looked at his scared face and smiled with tears. This exemplifies the sacrifice and spirit of our leaders. This is Badio with a team in a village. The bikes are loaded with equipment to show the Jesus film and Bibles. We also did two-day trainings in three counties. Many are unable to attend our school, so we send teams out to do trainings in their local area. These trainings are designed for spiritual leaders and pastors. Our Wordsower Bible Institute completed a two-week, Level 1 French class. Sixteen people attended the class. The Bible Institute trains the students in Bible doctrine, discipleship, starting churches, and becoming missionaries. We have an hour radio broadcast every day which presents the Gospel and teaches scripture. 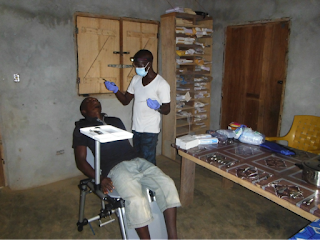 Our dentist treated twenty-eight patients and extracted thirty-one teeth. We have the only dentist in a five-county region. Here, Stanley is preparing to do an extraction. You are always welcome to be a patient; the cost is $5.00 or a chicken. We have distributed hundreds of thousands of bibles in over 1,000 villages and have handed out many audio Bibles. These audio Bibles are installed on small memory chips in their dialects that can be used in phones and music players. I return to Liberia this week. My load is valuable. I will arrive at 2:30 AM. Pray against the many thieves that will be waiting. Pray that the load and I will arrive safely on our base in Zwedru. We are shipping 2 barrels of much needed supplies on a ship. Pray that they arrive safely. Pray that we, the Wordsower Liberia leaders, will be filled with the Holy Spirit and fearlessly advance and spread the gospel. $72.50 – literacy Ministry. 4 classes of students meet each week. $85 - Bank to bank money transfer fees. Liberian banks charge transfer fees when we send money.